It’s good to know that the tiger population in India has increased by roughly 300 since Aircel first began their “Save the Tiger” campaign. At Lakme Fashion Week Summer Resort 2013, Aircel presented Fashion for a Cause that showcased the works of 40 designers. Each creation was inspired by the tiger and each ensemble was completely different from the rest. Some of the designs were ferocious like the majestic creature, some made a strong statement, and some took the theme very seriously. I liked several of them. Designer Pia Pauro travelled to Greece, fell so deeply in love with the blue sea and white homes, that she made a collection inspired by the country. 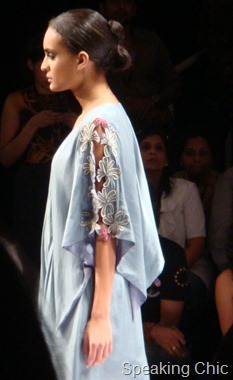 Pia Pauro’s collection at Lakme Fashion Week Summer Resort 2013 was mostly blue and white with a touch of gold and bright colours. Her prints were “Mykonous” and “Olympia” with fish motifs and gold thread embroidery. The very long and short dresses and tunics had cute turquoise bikinis peeping through, making the ensembles perfect for vacation in Goa, Greece or St. Tropez. Resort wear is always fun, though this collection could have been more fun with a few more interesting pieces. Too bad I’m not going anywhere! I want to carry those large beach bags. Veteran Indian designer Ritu Kumar will soon be honoured with the Padma Shri. She is the first mainstream designer to be conferred this well-deserved honour, with more than four decades in the fashion industry, preserving and promoting Indian textiles. 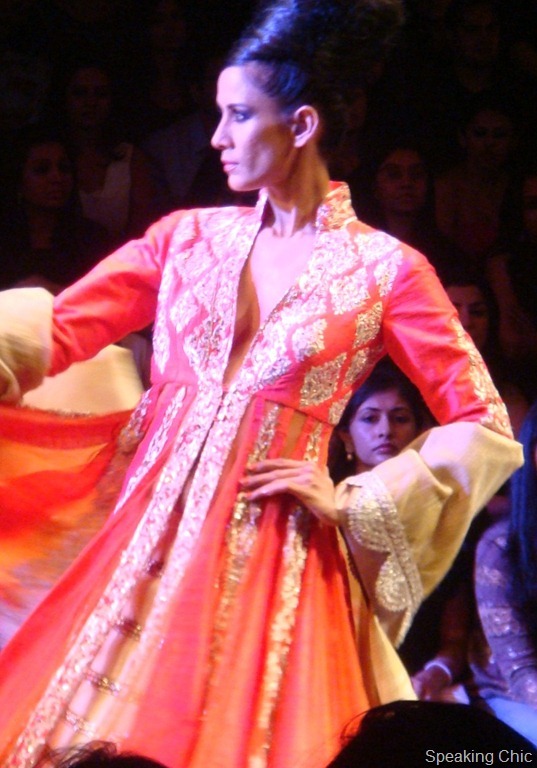 Ritu Kumar’s body of work has paved the way for contemporary Indian designers and was once synonymous with Indian bridal wear before the current breed of designers gained popularity. After all, some of the new bridal designers were probably infants while Ritu Kumar was revolutionising the textiles scene in India. Hats off, Ms Kumar! Meanwhile, Namrata Joshipura has been announced as the grand finale designer at the upcoming season of Lakme Fashion Week. 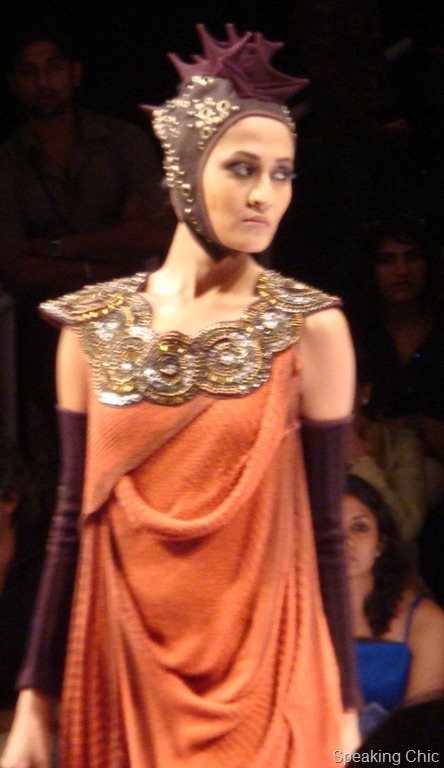 This will be Namrata Joshipura’s first show at LFW, which will be her interpretation of Lakme’s cutting edge makeup range. With the week’s renewed focus on upcoming talent, this is not a surprise. 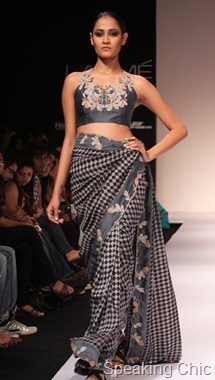 Last season, Kallol Dutta and Pankaj-Nidhi presented at LFW’s grand finale. The show was well-appreciated but not without controversy. 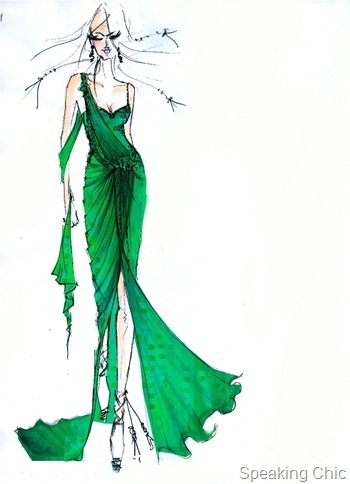 Everyone it seems, is cashing in on the Pantone colour of 2013- emerald green. Timex has introduced timepieces studded with emerald green China CZ stones and sparkling Swarovski crystals designed by Tarun Tahiliani. These India-inspired watches for women are available for Rs. 23,995 and Rs. 12,945. (Available at The Time Factory, Dadar, Mumbai). So if you can’t afford a TT lehenga, here’s your chance to own a piece designed by him. So what if it’s not your wedding joda? Jatin Varma’s show was themed Dark Angels, hence the colour palette was initially limited to steel grey, later shifting to jewel tones like purple and and rich blue. The collection comprised mini dresses and red carpet gowns with big shoulders and plenty of embellishment. The embellishments included metallic fringes, shimmery dust and gold discs and orbs. 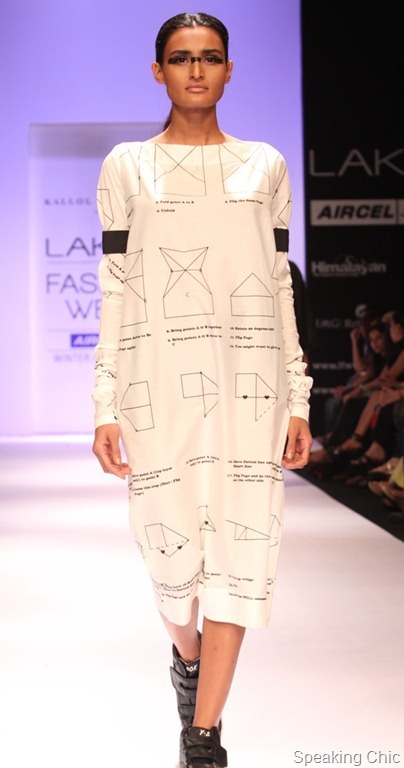 The details created a geometric pattern of sorts on the dresses, giving a bandage effect. 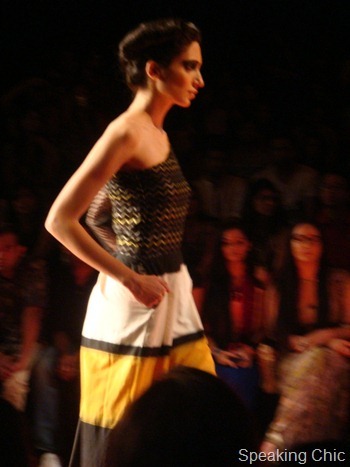 The designer also mixed ruffled fabrics and wool-like fabrics with the embellishments. Vizyon played with panelling, cut outs and peplums on their cocktail dresses and floor-length gowns. 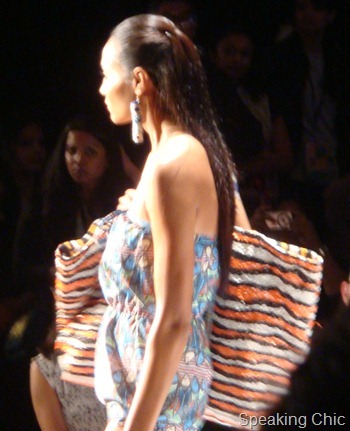 The combination of black, white and colours like green created animal print style outlines. Shimmery jackets and trailing gowns and mermaid cuts also made an appearance. Details like fabrics rolls and folds added a classy touch. 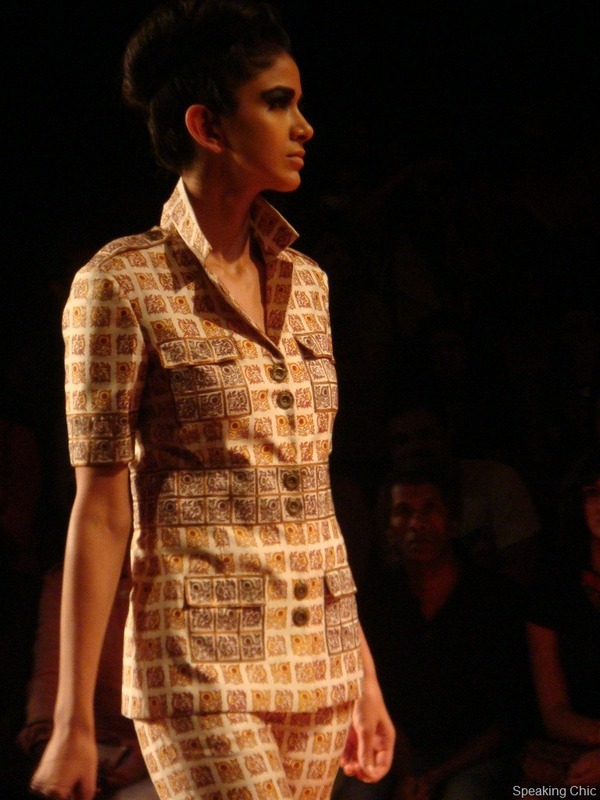 What to expect: Geometric printed cocktail saris, playful tunics, fluid dresses and gowns. 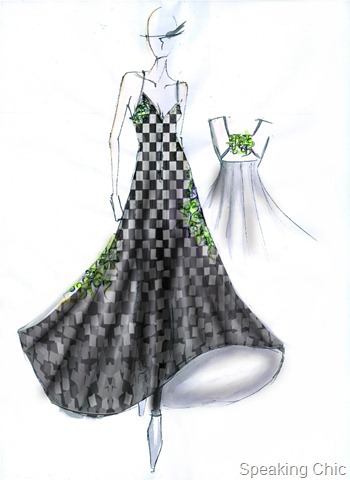 I’m liking the idea of a chessboard print on an embellished gown (see below). Maybe gowns will be fun after this. Colour blocking of bright hues like electric blue, bright yellow and shades of green offset against the tints of black, white and grey. 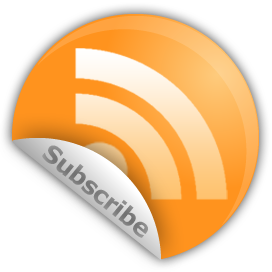 Watch out for: The Indian alphabet as embellishments- a very desi twist! You know the fashion, now it’s time to get the look. 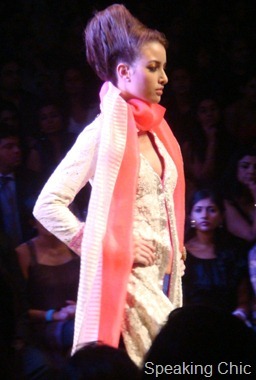 Using Speaking Chic’s introduction to Cocktail fashion, shop for Cocktail-inspired fashion on Myntra.com. As the official online shopping partner of the movie, the dedicated Cocktail section features clothes and accessories inspired by three lead characters. Check out the dresses, hot pants, prints and play suits for women. For guys, there are plaid shorts, shirts, blazers, casual jackets and aviator sunglasses. 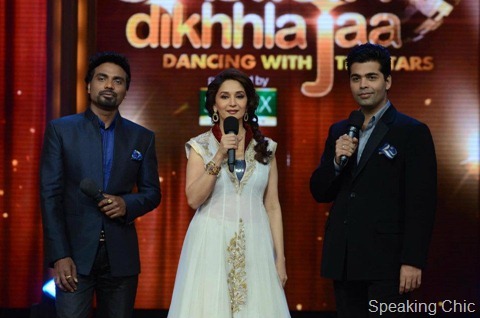 True, Jhalak Dikhla Ja is not the kind of show a fashion blog would recommend. But the judges’ wardrobe is a fashion treat. Madhuri Dixit’s experimental saris and sari gowns by designers like Gaurav Gupta are a must-watch, along with her anarkalis. Karan Johar is quite the fashion star too, wearing sharp jackets and blazers with interesting detailing (zips, embellished lapels). He’s being dressed by Shiraz Siddique. Jhalak Dikhla Ja airs on Colors, Sat-Sun 9 pm. If you hesitate to buy clothes online because you’re not sure they will fit, try shopping on Zovi.com. 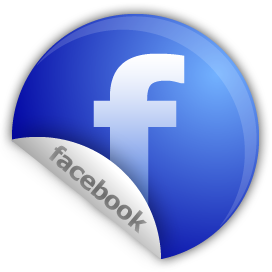 The Zovi Eye feature is a virtual trial room, and is a webcam application that lets you view yourself in an outfit of your choice. And if the right shoe size is as elusive as the Indian tiger, the website’s “Try N Buy” is just what you need. It’s simple- try on the shoes you ordered at time of delivery, and return them if they don’t fit correctly. 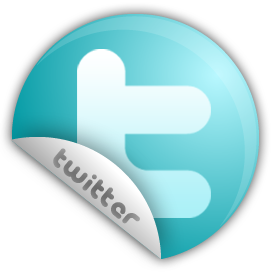 PS- Try out the Zovi Eye feature here. 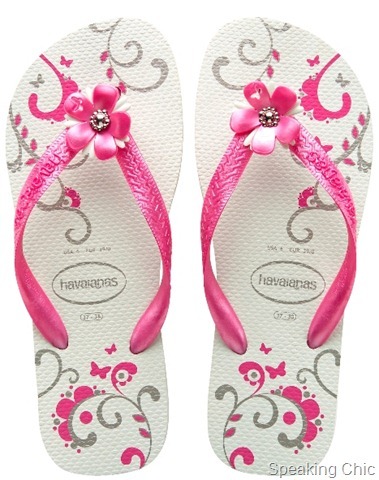 Havaianas are now available in India! 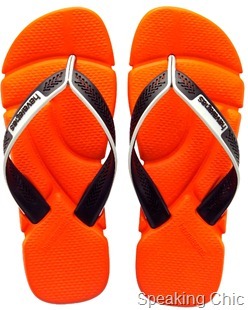 With their secret rubber formula, these colorful flip-flops are soft, light, durable and super comfy. I wonder how many Indians would want to spend Rs 790-3800 on chappals, but since the brand is almost a cult, I guess there should be some takers. Shop for Havaianas at Vama, Mumbai or The Beach Company. Lakme Fashion Week Winter/Festive 2012 is less than a month away. So block your calendar from August 3 to 7 to get a taste of the upcoming festive season’s trends and collections. This season, Kallol Dutta and Pankaj-Nidhi will close the five-day event, while several leading and emerging designers will present their collections. 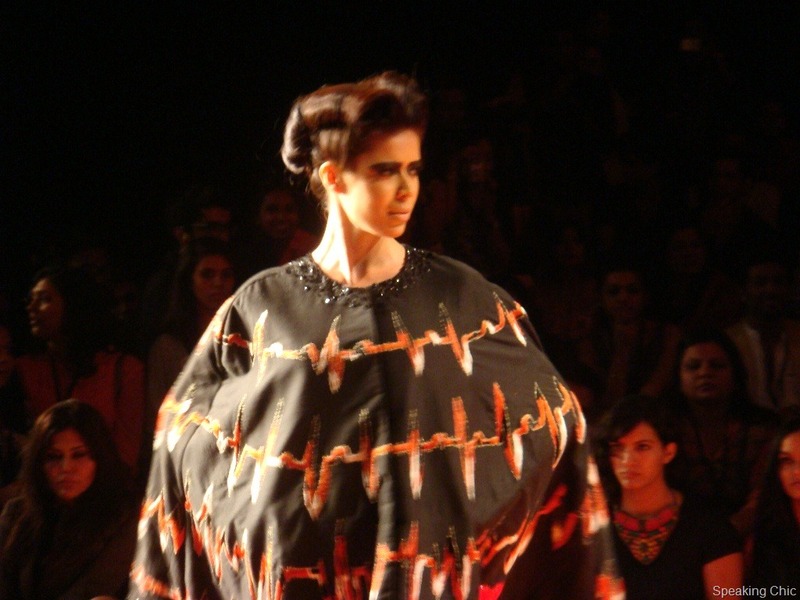 Some shows to look forward to: Wendell Rodricks, Ritu Beri, Pallavi Jaikishen and Drashta. This post on Kareena Kapoor’s clothes in her recent movie Bodyguard was due at least a week ago. But then I decided to do some additional research and go back to my six-m0nth-old archives to understand the story behind how Manish Malhotra chose his clothes for Kareena. Here is Kareena Kapoor in the outfit she wore in the last scene of Bodyguard, and here she is attending Manish Malhotra’s Lakme Fashion Week Summer/Resort 2011 show, and a model from that show. 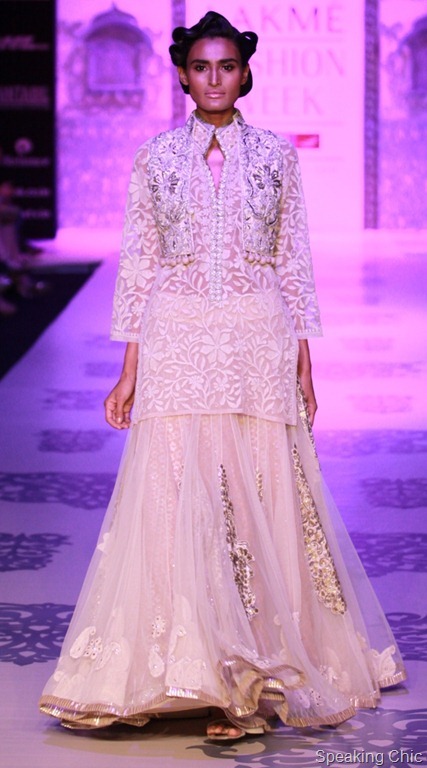 We got four words for you: Kashmiri embroidery, chikankari work! 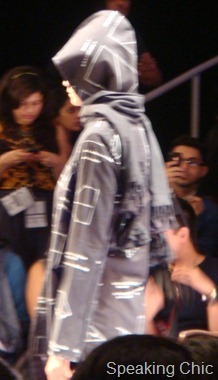 It’s wonderful to see a designer create regular clothes using thematic elements from his fashion week collections. Ultimately, most women want to wear what Kareena, Katrina or Kalki is wearing in their favourite movie, right? PS—A male friend of ours (and a Speaking Chic reader) is already raving about Kareena Kapoor and her red outfit in Chammak Challo from Ra.One. 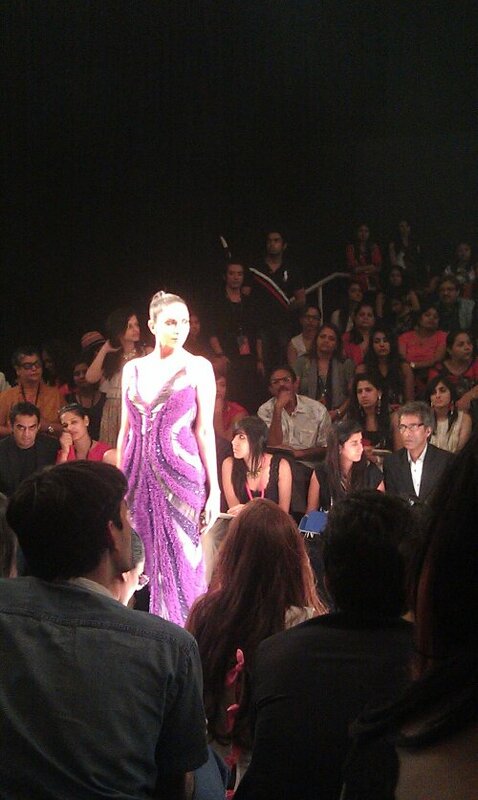 That’s Manish Malhotra again! 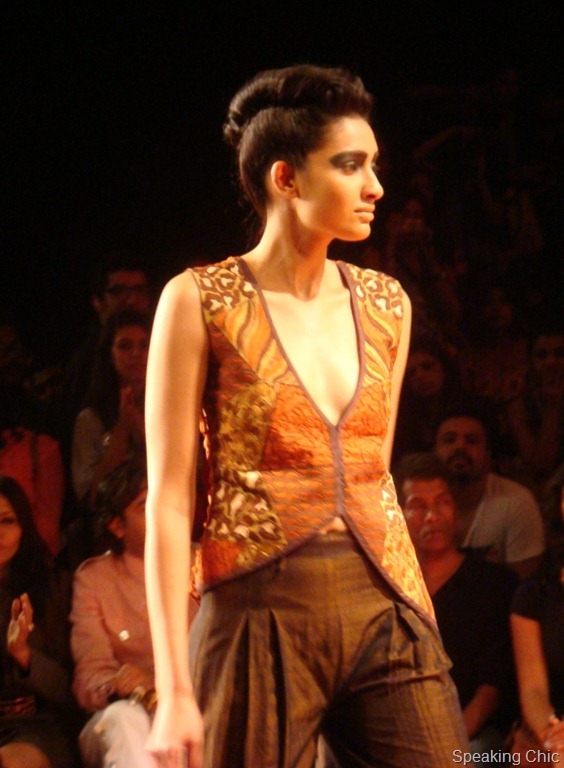 It was an elaborate set made of giant wooden frames and a clock-mechanism appearance– perfect for the final show of the five-day extravaganza Lakme Fashion Week Winter/Festive 2011. Manish Malhotra’s collection was as dramatic as any Bollywood movie. Making the most of chikan work and silver and resham embroidery, the ace designer created a collection of breathtaking festive and wedding wear that introduced a few new elements while retaining the Manish Malhotra signature. 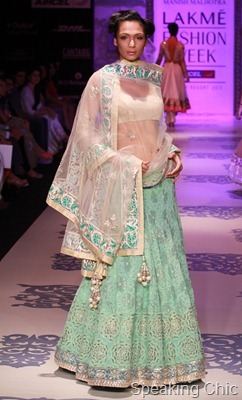 The silhouette for women was of graceful panels and flared lehengas and gowns. 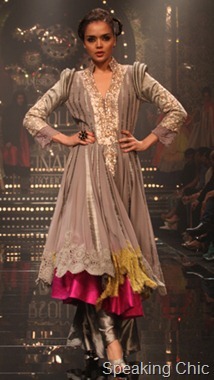 Manish paired swirling lehengas, well-constructed cholis and saris for women, with elegant jackets and corset blouses. 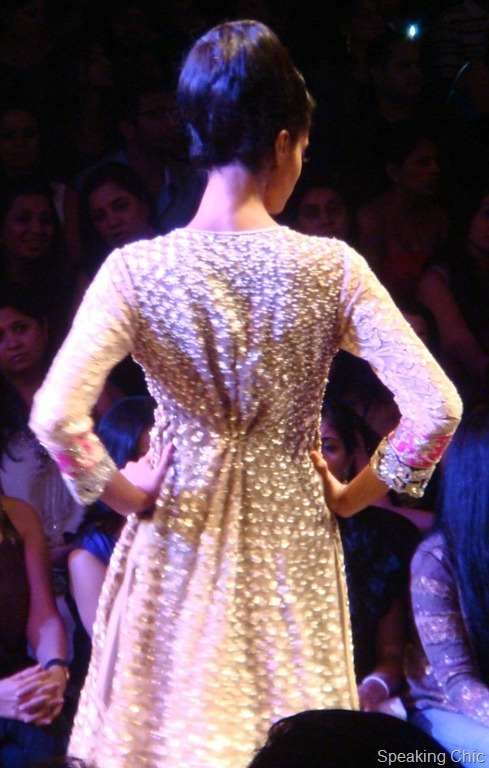 Embellishments were everywhere– on the sleeves, down the front, on jackets and cholis, along with multiple borders. 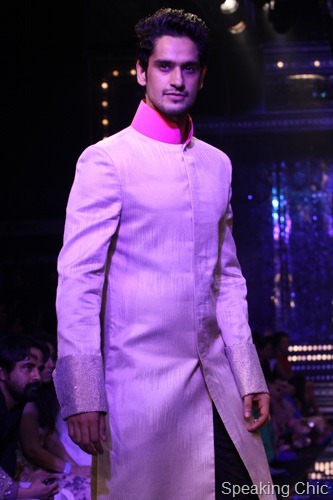 Manish kept the colours tones festive with white and candy floss pink, in contrast to black, wine, gold, pale grey, metallics and cherry red. We noted that the designer had mixed, matched and clashed colours for a strong impact. For instance, a grey kurta with a longer bright pink lining, or orange and pink in the same outfit! The opulent clothes were stitched from rich fabrics like lace, chiffon, silk, net and velvet, while most dupattas were kept sheer. For men we saw sherwanis and long coats with wide cuffs, pleats and gathers, even as some coats were lean and layered over kurtas. 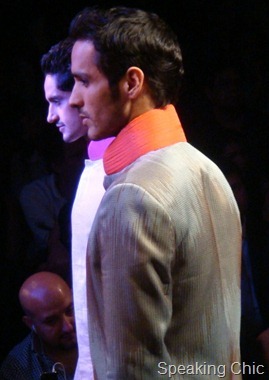 The colours were masculine (black, grey, wine), albeit with a hint of fuchsia for collars and cuffs. And oh, in case you haven’t heard already, Kareena Kapoor was the showstopper (she is also the face of Lakme Absolute, on which Manish’s collection was based). From ethical fashion to fashion designed for a revolution, Digvijay Singh for Bhu:sattva and Vivek Kumar presented collections that gave us plenty of food for thought on Day 5 of Lakme Fashion Week Winter/Festive 2011. 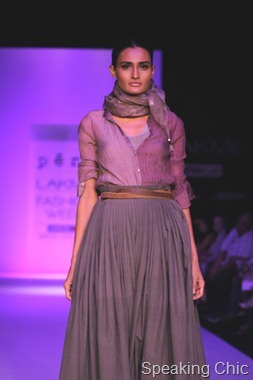 With its certified organic fabrics, Bhu:sattva stands for ethical fashion and for the brand’s Geometrees collection at LFW W/F 2011, designer Digvijay Singh used natural vegetable dyes and block prints on saris and drapes. 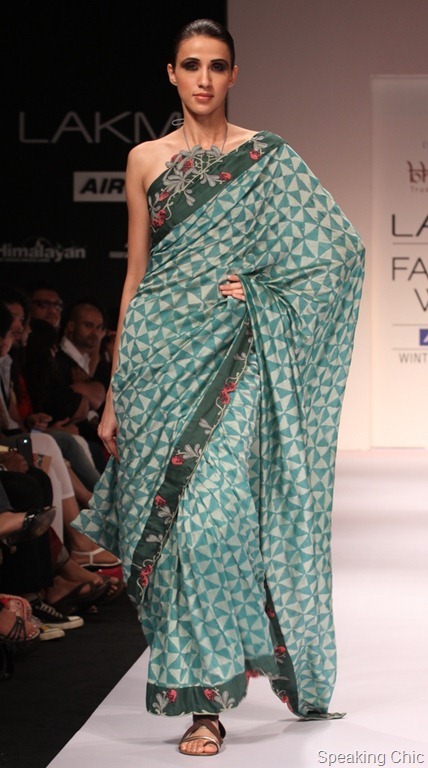 Digvijay Singh combined botanical and floral embroidery with Mughal geometry to create gorgeous, yet simple saris. Gujarat’s khatla embroidery was extensively used with detailing on on shoulders, sleeves and back. Small beads, applique and cutwork broke the monotony, as did the two-toned checks and saris in colours like brown, black, blue and green. 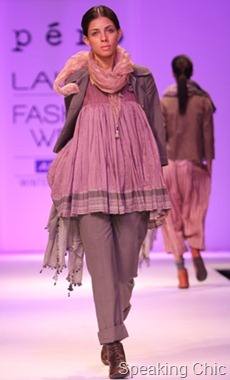 We enjoyed the collection for its immense wearability and versatility. 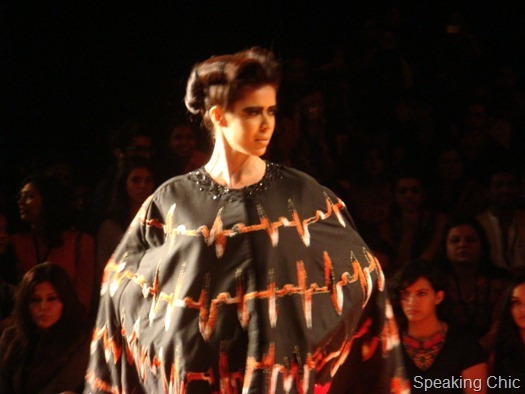 It isn’t easy to describe Vivek Kumar’s collection. There were dresses and gowns, but it wasn’t just about the outfits. Nor was it about the knitted bonnets with spiky studded projections. It was about all the small things that made Antarkranti (inner revolution) an astounding collection. 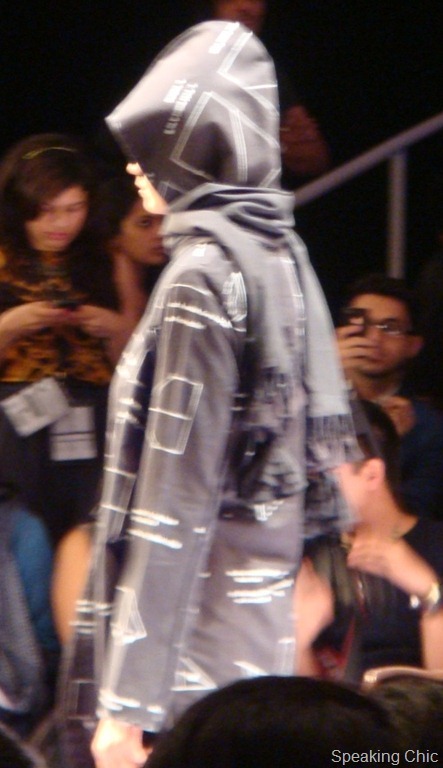 The models were geared up for battle in fluid silhouettes in sombre colours like black, grey and steel that made way for green, orange and rust. 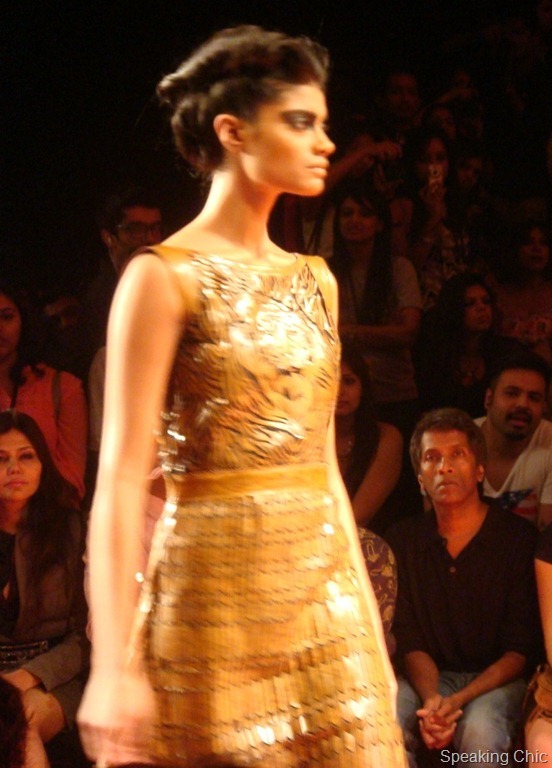 Steel studs, zippers and sprays of sequins adorned the nets, knits and batik fabrics. 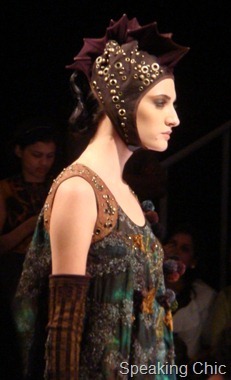 The detached long sleeves, knee high stockings, hand knitting and inserted stitches added to the drama on the ramp. The clothes weren’t meant for immediate retail, but Vivek Kumar’s innovative approach is bound to be loved by fashion lovers everywhere.